Undecided which one to buy? 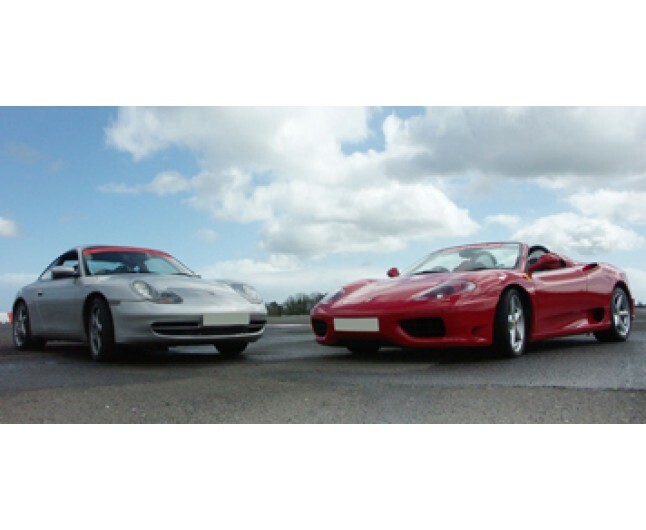 Get behind the wheel of both these 2 famous supercars! Our best selling experience was recently awarded a whopping 4½ stars out of 5 by AUTOCAR MAGAZINE when reviewed at our Staffordshire Circuit. They said that this experience is "the stuff that's worth your time (and money)". Many of our customers have said that they could hear their heart beating when they first sat behind the wheel of these famous Supercars. Trying to describe what it's like to drive a Ferrari or Porsche is impossible. We could wax lyrical about the individual styling, the smell of hide or the crisp wail of their Powerful engines but it wouldn't begin to do it justice. Enough said. Like any first they always remember when it happened, where they were and who bought it for them. For any spectators you bring along! A truly amazing experience! This is a moment you will never forget! This gift experience is for one person only. The experience is valid for 12 months from date of purchase. Not to be used in conjunction with any other offers or discounts. Please book well in advance. This experience will last for 4 hours, please arrive 30 minutes prior to your arranged start time. Starting times are 9am and 1pm. You must be in possession of a valid driving licence to take part in this experience. Your experience will go ahead subject to safe and suitable conditions on the day. Spectators are welcome. For safety reasons, please ensure that the user of this experience wears flat, sensible shoes on the day and dresses appropriately for the weather on that day. You must be under 6'5" and weigh less than 18 stone. Itineraries and vehicle models may vary slightly depending on the venue.